My friend Color Girl makes wonderful, insightful resolutions for her New Year's intentions. Resolutions like finding more things in life that scream WOW! and relearning how to play and researching ways to age well physically and spiritually. In my own take on this charming way to look at New Year commitments, I have decided to consciously look for things that make me smile...in a whimsical, youthful way...lest I leave a happy chance to smile go unnoticed. On this New Year's Eve 2013-14, that smile material is definitely in the shape of a bicycle. they shall be mine!...For a mere $8.00 no less...another smile generator. One cycling thought spawns another, and soon I was reminiscing about another Salida visit...this one in the summer and a trip to the Saturday farmer's market in the town park. 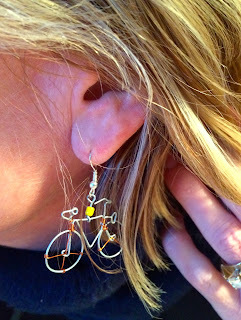 of handmade jewelry and handbags...made of recycled bicycle tires. Yet another occasion for this gal with an earring fetish to indulge...smiling all the while. Do tell please. What makes you smile?